Thanks for stopping by Day Two of the 12 Days Of Christmas 2018 Event! 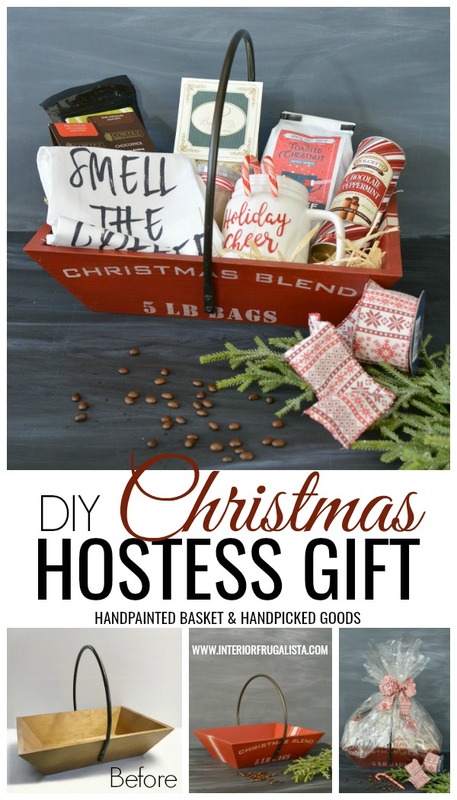 Today is all about DIY Gift Ideas and I'm sharing a DIY basket for that special holiday hostess gift. 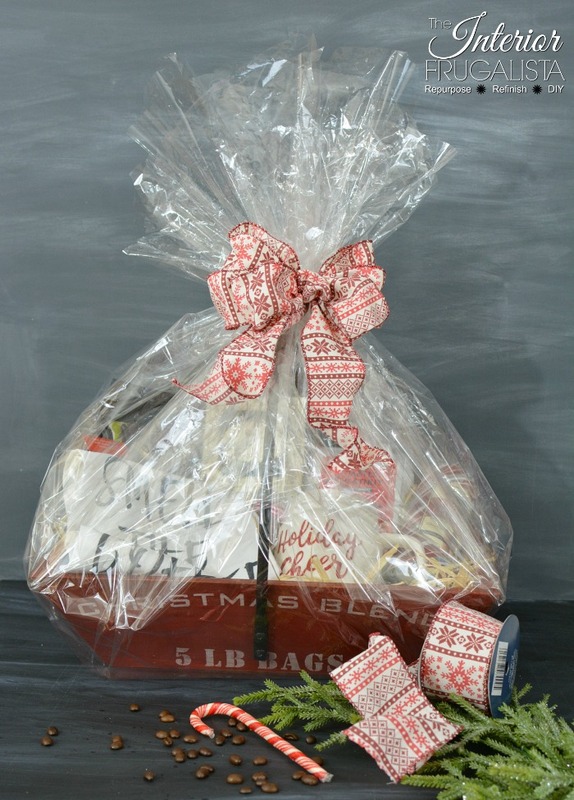 Gift baskets are always so popular during the holidays and so nice to receive. But what about adding a made with love personal touch that has lasting memories? 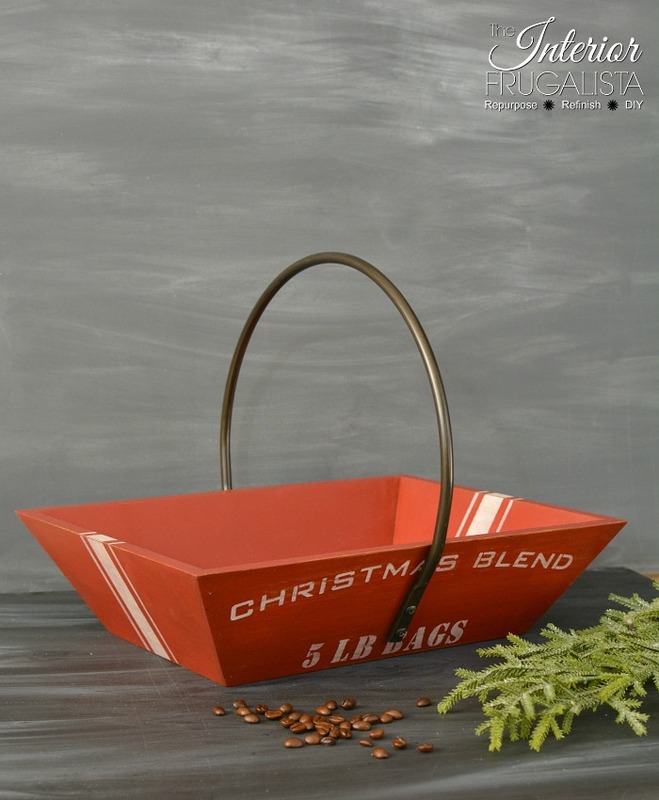 That's exactly what I did with my handpainted wooden basket with handpicked hot beverage accoutrements. It's our Second Day of the Fourth Annual 12 Days of Christmas Series! 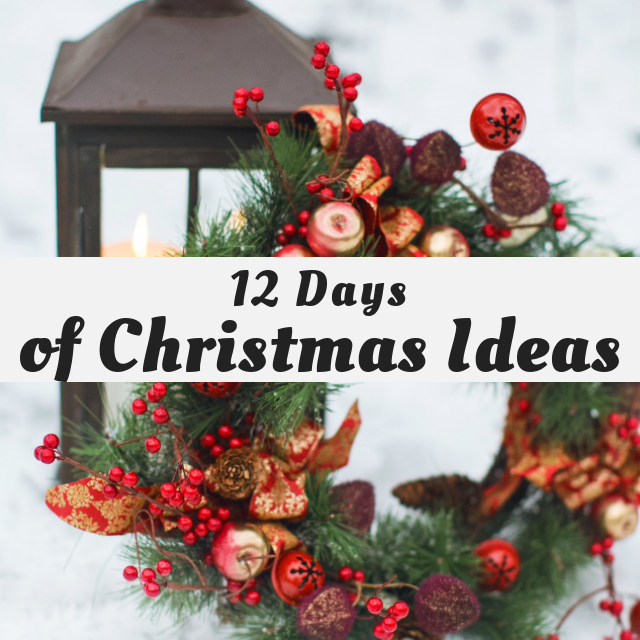 It's Day 2 and we are sharing DIY Gift Ideas! It all started with this wood basket with black metal handle found at Goodwill for a whopping $2. 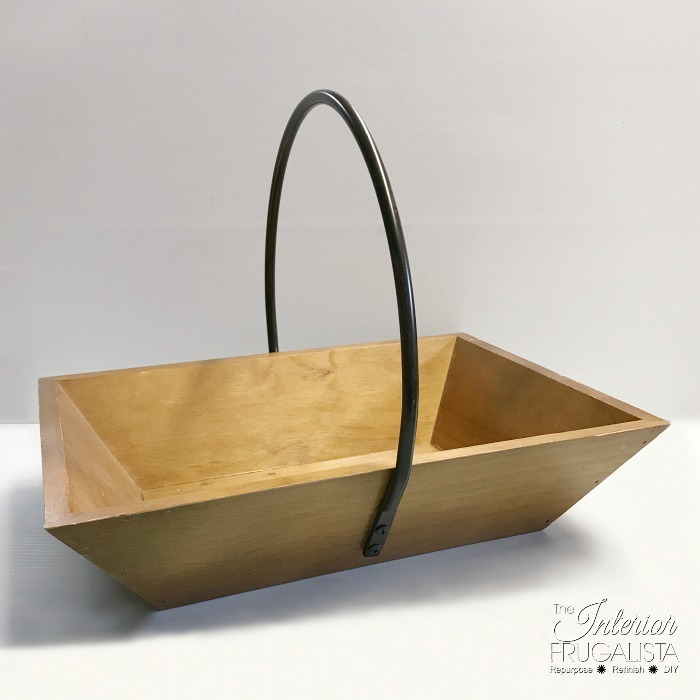 I immediately thought it would make a unique basket for a hostess gift during Christmas and so it sat in my workshop for several months waiting for the holidays. 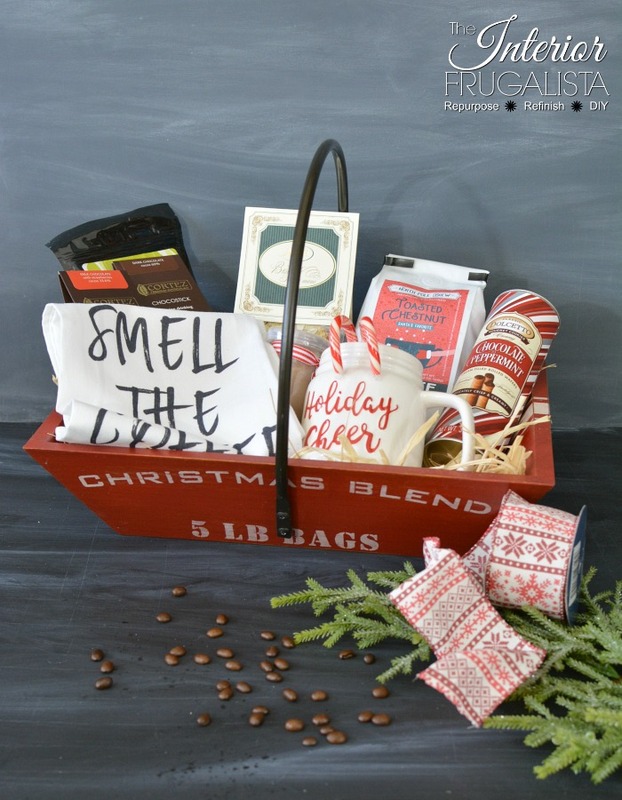 Painted a festive red with some coffee and hot chocolate related stencils and it makes the perfect container for a hostess gift basket. Then I went shopping to handpick a selection of hot beverage blends and related goodies to fill it. 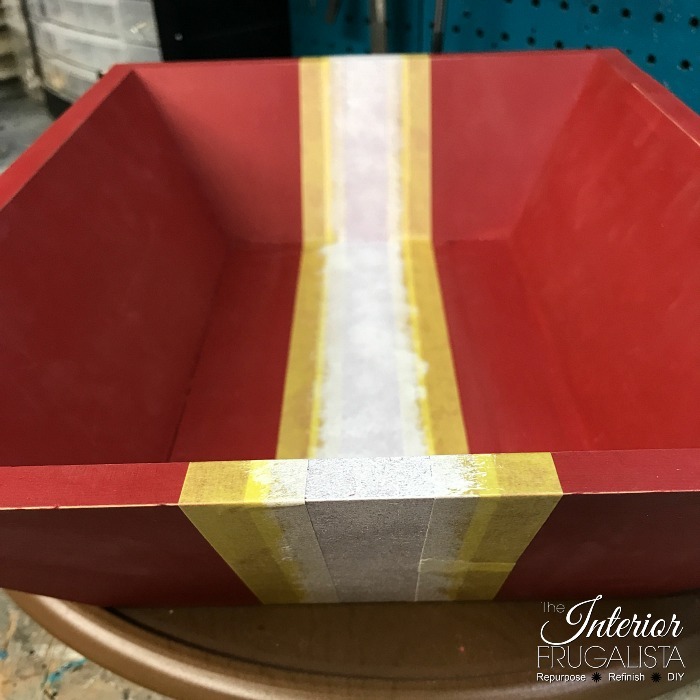 I've included affiliate links in this post for your convenience so you can see what products I used or recommend to make this project. See my full disclosure policy. Last year I purchased several gift baskets and found the nicer the container, the higher the price and most often over my budget. 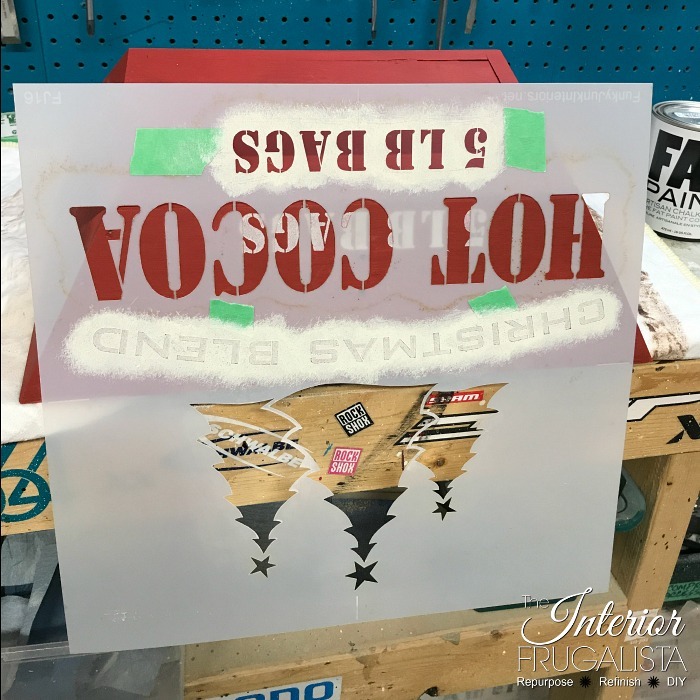 So for $2 and a little bit of paint and elbow grease, makes this an affordable option for getting the high-end look with a budget-friendly price tag. 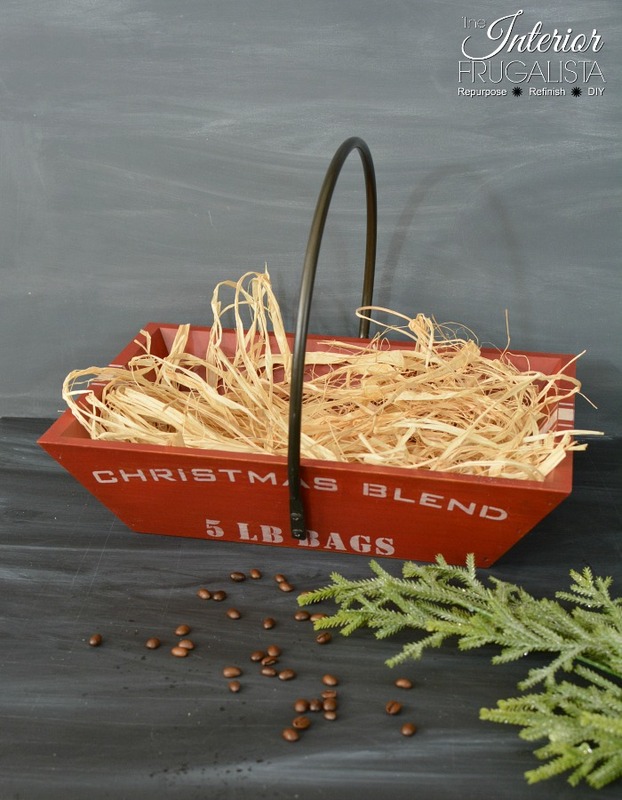 Now we're ready to fill the Christmas basket with those handpicked goodies. I completely forgot to buy crinkle paper filler to line the basket and so I used natural raffia that I had on hand. I placed the larger items in the basket first and filled the cavities with the smaller goodies. The coffee-inspired tea towel is folded and placed in the forefront beside the festive mug to be seen through the wrapping. And now we're ready to wrap this gift with clear cellophane and a cozy sweater ribbon bow. I am all thumbs when it comes to wrapping cellophane all pretty like the professionals. I went to YouTube for helpful tips and thought I'd share the gift basket wrapping tutorial I found in case you struggle too. The same goes for making pretty bows so I cheat and use this super easy bow making tool that I've had for years and can't do without. I even used it for making a bow topper on my Christmas Tree one year. 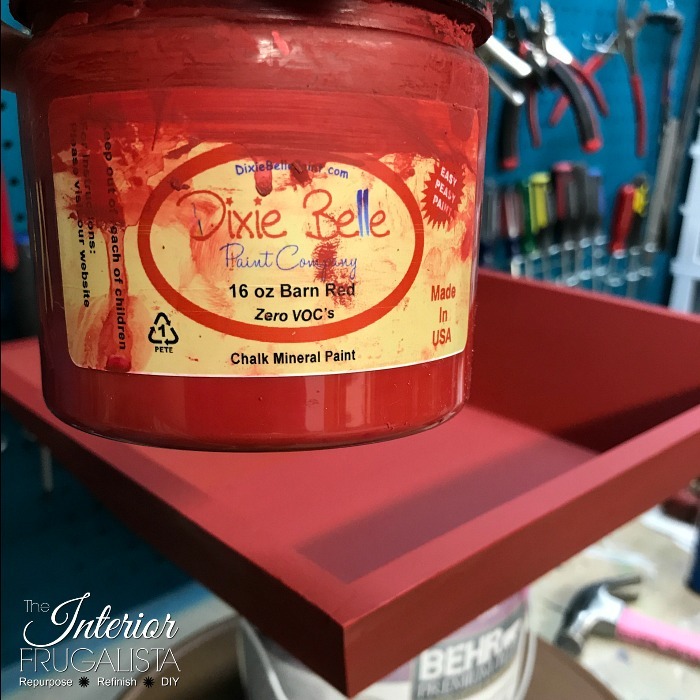 After a good scrub with vinegar and water and a light sand with 150 grit sandpaper, it was painted with two coats of festive Dixie Belle Barn Red chalk mineral paint. Can you tell by the condition of the jar how much I love this color! I thought adding grain sack stripes would be fitting inside the basket for a nice touch after the basket is emptied. It's easy to do with Delicate Surface Frog Tape and white chalk or acrylic craft paint. 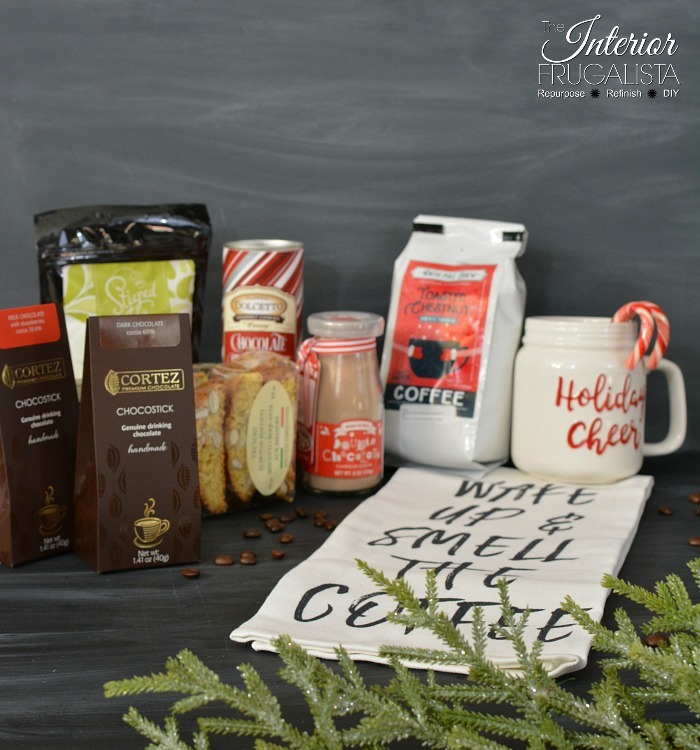 And to pull the whole beverage theme together I used part of this Homestead Blend Coffee Stencil and this Christmas Blend Hot Cocoa Stencil (not affiliate links) with the same white chalk paint. 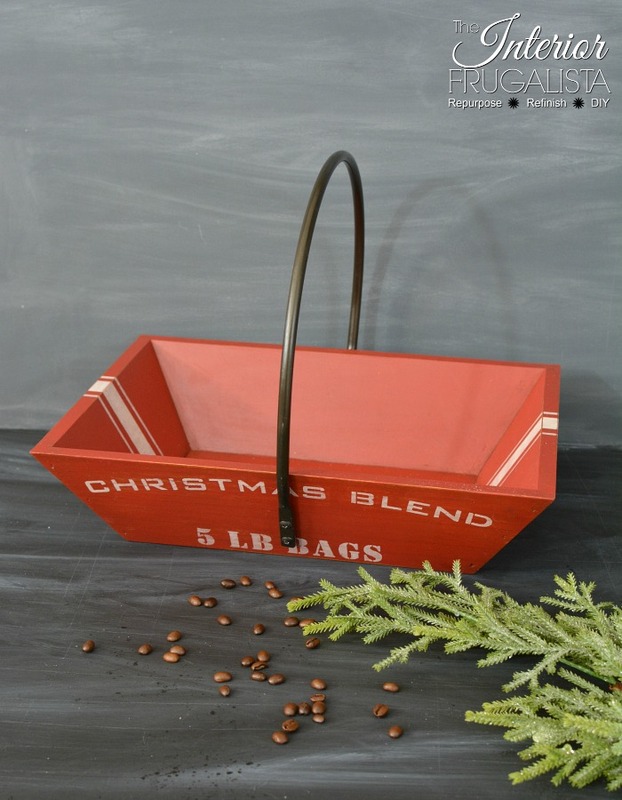 Once the paint was dry I lightly sanded the stencil to give it an aged patina and brushed Dixie Belle Black Wax over the entire basket, leaving it heavier in and around the corners with my favorite round brush. I think any hostess would appreciate the handmade and handpicked sentiment of this holiday hostess gift, don't you agree? 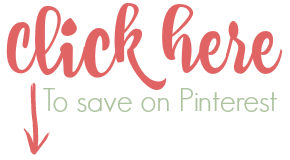 Now I invite you to scroll down to see many more DIY Gift Ideas!